Refugees in Uganda's Imvepi Camp. Geneva, 28 November 2018 - The UN's refugee agency wasted tens of millions of dollars in Uganda in 2017, overpaying for goods and services, awarding major contracts improperly, and failing to avoid fraud, corruption, and waste, according to a damning internal probe. The audit, by the UN's Office of Internal Oversight Services, found multiple areas of mismanagement that were UNHCR's responsibility, such as a $7.9 million contract for road repairs awarded to a contractor with no experience in road construction, and questionable payments to trucking and bus companies worth $7.7 million. It noted "pervasive non-compliance" with regulations on "vast sums" spent on water trucking and that UNHCR paid at least $10 million more VAT than it needed to. Tens of millions of transport-related invoices are still being disputed with contractors. The audit also found stockpiled goods, more lying idle than had been distributed in the previous 12 months, including 288,000 blankets and 50,000 wheelbarrows. In addition, 15,000 solar lamps worth $279,860 were found to have gone missing, and no proper investigation was done. Uganda, a low-income country in East Africa of about 42 million people, hosts over a million refugees, more than anywhere bar Turkey and Pakistan. From 2013, worsening conflict in South Sudan led to a mass exodus into northern Uganda; the pace accelerated from mid-2016 onwards. By 2017 Kampala's goodwill was seen as critical to providing a safe harbour for hundreds of thousands of South Sudanese refugees, and an aid official familiar with the situation, who requested anonymity due to the sensitivity of the issues, said UNHCR seemed "desperately cautious not to upset the Uganda government." 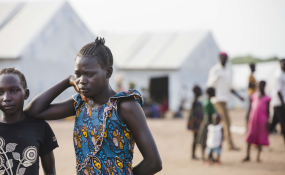 The aid official explained that the international community had been "singing Uganda's praises" as a "model country" due to its liberal and progressive refugee-hosting policies at a time of rising anti-refugee sentiment. Uganda "was branded globally as the example to follow", said Julien Schopp, director of humanitarian practice at US NGO consortium InterAction. "Does that influence the oversight and dissuade UNHCR from digging a little deeper and uncovering corruption and mismanagement. Who has leverage on who?" UNHCR's expenditure in Uganda jumped from $125 million in 2016 to $205 million in 2017, Four donors (Britain, the EU, Germany, and the United States) contributed about 80 percent of the 2017 funding, according to the UN's Financial Tracking Service. Major problems first emerged in February 2018. The UN alleged that Ugandan officials were diverting aid by colluding to pocket supplies issued to fake refugee identities. A threat of a freeze on donor funds led the Ugandan government to replace its head of refugee affairs and agree to a complete recount of its refugee population, managed by UNHCR. UNHCR announced in February that its Inspector General's Office, which can refer staff for disciplinary or other measures, had opened an investigation into "fuel embezzlement, one allegation of sexual exploitation and abuse, irregular tendering of water trucking, and fraud in procurement and food distribution." The internal watchdog also reported in July that UNHCR was assisting Ugandan investigations into "corruption by government officials relating to, among others, irregularities in land allocation to refugees, bridge construction, theft of food and non-food items and fuel mismanagement." But the UN's internal audit, released last week to the public but not previously reported, provides a wealth of new detail on UNHCR's role in mismanagement - and likely fraud - affecting refugee registration and services in 2017. It also offers new details on UNHCR's relations with the Ugandan government. Refugees fall under the Office of the Prime Minister (OPM), Ruhakana Rugunda. Julius Mucunguzi, a spokesperson for the OPM, told IRIN that investigations were still ongoing, include into four employees suspended by the government. Mucunguzi declined to comment on the audit, saying, "UNHCR has got its own processes". A persistent challenge in the Uganda aid operations was accurately counting the number of refugees. The audit found that from 2015-2017 UNHCR paid the government $14.6 million to set up and run a new refugee registration platform. However the IT and biometrics system couldn't cope with the South Sudanese 2017 influx and couldn't be fixed in time. The audit also found that UNHCR rarely had access to the data required for planning and verification. To help restore donor confidence, refugees in Uganda were recounted and re-registered from March to October using UNHCR's latest systems, at an additional cost of $11 million. The audit warned, however, that using two systems could cause problems in future. The re-registration process counted 24 percent fewer refugees than reported by the Ugandan government, a reduction from about 1.4 million to 1.154 milion. However, the government spokesman Mucunguzi added that Uganda "has nothing to hide" and said that this year's biometric recount helped build a much stronger system with "no gaps and loopholes". The audit found a range of inappropriate arrangements between the Uganda UNHCR office and the OPM. For example, UNHCR agreed to contract three underqualified local NGOs recommended by the OPM, one of which had defrauded UNHCR before. It also paid $2,000 a month to senior Ugandan officials who signed off on UNHCR-related paperwork and provided them cars and fuel. In addition, the OPM had not reimbursed UNHCR a previous demand for $250,000 of excessive fuel usage. UNHCR also paid $283,000 to subsidise the costs of 72 civil servants whose work contracts could not be shown to the the auditors. The UN's refugee agency also paid for OPM to buy a plot of land adjacent to its office, ostensibly to expand refugee handling capacity. However the price, $320,000, was more than double the government's valuation, and the OPM couldn't produce a title deed to prove ownership. The audit found the plot is now being used for car parking. The audit is unusual in the high number of problems it found. It has six "critical" recommendations, more than any other audit of the 907 the UN's oversight office has published in the last five years. Over 770 audits passed without any critical findings. The report notes that UNHCR was warned about many of the weaknesses cited in the recent report in a similar 2016 review, but had failed to fully resolve them. "Critical" recommendations apply to "significant and/or pervasive deficiencies or weaknesses". UNHCR Uganda received seven of the lesser category of "important" recommendations in 2016, and six in 2017. The European Commission, a major donor to the refugee operation, said in February it had referred the Uganda corruption case to its anti-fraud office. The audit demands "accountability" for failures over the water trucking and over refugee registration. UNHCR declined to answer if there were any disciplinary actions yet. Its statements have so far backed its country representative, Bornwell Kantande, and emphasised the alleged failings of the Ugandan government. Four Ugandan officials were forced to step aside in February, pending investigations, including the head of the refugee department in the OPM, Apollo Kazungu. Three others were in more junior roles. Kazungu told IRIN he faces no specific charges yet but is off duty. UNHCR's Kantande was replaced in March 2018 by a veteran UNHCR manager, Joel Boudreau. Kantande now holds the post of Head of the UNHCR Regional Service Center for East and Horn of Africa. UNHCR says it has "zero-tolerance" for fraud and corruption. The Uganda office, according to the audit report, has begun a wide range of reforms and tightened up procedures since the issues came to a head in early 2018. UNHCR declined to answer a list of questions from IRIN. In an emailed statement, its spokesperson, Babar Baloch, said the organisation accepts the recommendations of the audit, adding "we acknowledge that serious shortcomings were found and have started taking action."